I would like to seek help on how to create a confirmation message with Replace and Cancel buttons. And also, how can I check if user clicked the Replace button. div tag, with 2 buttons and text to display. if clicked 'replace' call respective function() with ur required code in it  or set a global var. with value=True. There are sites provides u help on this. go and search. I guess I misunderstood your problem in my last post. Here is an article I read some time back written by Haissam Abdul Malak (a very active user of this forum). Link of the article is http://aspalliance.com/1366_Building_a_Custom_Confirmation_Dialog_Box.all I believe it will give you some idea on how you can achieve your goal. It will provide you a custom confirm window. Firing server side validation & Client side confirm with a single button..
How to display message box at client side? Message Box to client for a confirmation- Is there a way? 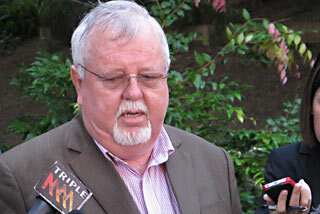 Queensland will be without one of its senators until at least February next year.